Large(1,100 sq ft) private suites are what make Emerald Greens Condo Resort stand out: your condo comes with granite counter tops in the kitchen, a living room with a private balcony, and ultra-comfy memory foam beds. The Country Club and golf course make Emerald Greens a natural choice for business travelers (the coporate offices of Tampa are 10 minutes away) and groups looking for resort-style entertainment for meetings or a wedding. The resort offers 5,200 sq ft of meeting space and dedicated event coordinators on site. Never stop learning: take lessons in golf, swimming or tennis from the club's pros. 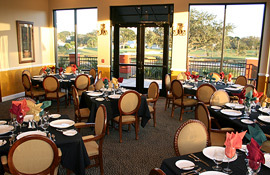 Dine indoors looking over the greens or al fresco at The Terrace Bar and Grille at the Clubhouse. The Oasis Bar & Grille serves a relaxed poolside menu, and the TurnGrille is beside the golf course so you can grab a bite while you play. Emerald Greens Condo Resort is 20 minutes from Tampa International Airport, close to shopping, restaurants, nightlife and Busch Gardens. Modern, Fully furnished and decorated suites. Fully equipped kitchen including all appliances (stove, full-size refrigerator with icemaker, dishwasher, cookware, dishware and utensils).